There are a plethora of digital and print resources at UNL for the study of medieval and Renaissance eras. For an extensive listing of all the journals, primary source databases, printed books, and so much more available at UNL, see the Medieval and Renaissance Studies Library Guide. Of particular note--due to their rarity at institutions, and invaluable help for early modern research and paleography training--are the Love Library subscriptions to Early English Books Online (1475-1700), Eighteenth Century Collections Online, and the State Papers Online (Tudors, Stuarts, and Foreign). They also have an online Shakespeare exhibit. UNL Love Library has also recently begun to acquire e-books that expand the scope of the library collection, and are accesible off-campus to UNL students. UNL also offers InterLibrary Loan services, and has a Digital Commons with open access to UNL dissertations, theses, and faculty research. There are also multiple large flatbed and smaller-sized scanners in the library. There is also a Multimedia Equipment and Software center on the second floor next to the computer lab that can supply cameras, camcorders, tripods, and much more for checkout to UNL students. The UNL archives hold an amazing medieval and Renaissance era set of primary sources. There are two illuminated medieval manuscript books: Horae beatae Mariae Virginis (Northern France, beginning of 15th century) [i.e. a Book of Hours]; and Bellus Jugurthinum et Catilinarium (15th century). There is also a manuscript from the reign of Queen Elizabeth I, that still bears her royal seal. There are also numerous incunabula, and sixteenth- and seventeenth-century printed books. For example, UNL owns books printed by Anton Koburger, Christopher Plantin, and Wynkyn de Worde; 16th century printings of works by Dante, Ovid, Galen, Petrarch, and Chaucer; a leaf of the the Gutenberg Bible; a first folio of William Shakespeare's works; Konrad Gesner's Treasure of Euonymus (1565); Thomas Hill's The Gardeners Labyrinth (1586); all three volumes of Raphael Holinshed's The Chronicles of England, Scotland, and Ireland (1587); John Speed's The Historie of Great Britain (1623); John Smith's The Generall Historie of Virginia (1624); Gerhard Mercator's Atlas Minor (1634); John Parkinson's Theatrum Botanicum (1640); Sir Richard Baker's The Chronicle of the Kings of England (1660, 1679); William Camden's The History of the Most Renowned and Victorious Princess Elizabeth (1675); and all three volumes of John Foxe's Acts and Monuments (1684). The UNL Medieval and Renaissance Studies Program is a member of theNewberry Library Center for Renaissance Studies Consortium. This enables some of our students to use Consortium funding to attend scholarly programs and do research. This Consortium also gives students the opportunity to get funding for programming or advanced research at the Folger Shakespeare Library. UNL has recently begun to offer access for students to the Adobe Creative Cloud (includes Adobe Acrobat, Dreamweaver, and Photoshop). You can access the software from home, rather than having to use the UNL Media Center or computer labs for access to these programs. The Center for Digital Research in the Humanities (CDRH) advances interdisciplinary, collaborative research. Humanities faculty and students affiliated with the Center are expanding our understanding of history, literature, languages, and culture. The Center also develops unique digital content and tools for scholarly discovery, and offers workshops and forums on humanities topics. The Center for Digital Research in the Humanities (CDRH) is a joint program of the UNL Libraries and the College of Arts and Sciences. It was officially established by the University of Nebraska Board of Regents in 2005 and has been designated a Program of Excellence at UNL since 2004. While perhaps better known for its exhibits and collection on modern and American art, the Sheldon Art Museum also holds over 200 late medieval and early modern prints (woodcuts, etchings, engravings, and mezzotints), including Rembrandt's Christ Seated, Disputing with the Doctors (1654) and The Raising of Lazarus (c.1632); Albrecht Durer's The Fall of Man (c.1510) and Roswitha von Gandersheim (1501); Giovanni Boccaccio's De Claris Mulieribus (1473); Speculum Humanae Salvationes (Explusion from the Garden) (1473); woodcuts from 16th century Books of Hours; a handcolored woodcut "God Speaking to Moses" from a German Bible (1483); Der Ritter von Turn (A Sick Woman on Her Death Bed) (1493); William Hogarth (87 items alone), Wenceslaus Hollar, Lucas Cranach, Hans Holbein the Younger, Michel Wohlgemuth, Jost Amman, William Blake, Jean Duvet, Hans Burgkmair, Jacques Callot, Jean le Pautre, Stefano Della Bella, James Gillray, Hendrik Goltzius, Samuel Hill, Maria Catharina Prestel, Maarten de Vos, Lucas Vorsterman, and Jusepe de Ribera. Dr. Alison Stewart, Professor in the Department of Art & Art History, teaches an art history course "History of Prints: New Media of the Renaissance" which results in a collection publication (fall 2011; fall 2013) and exhibit in the Sheldon (Media Revolution; Society and Style). The Quilt Museum, as its often called, has over fifty pieces of cloth and quilts that span the years 1600-1800 and come from the Netherlands, France, America, India, and the United Kingdom. For images and more information about these items, search the Quilt Museum's online database, using the Advanced Search date range function to limit it to "1600" - "1800". Joslyn Art Museum features distinguished paintings by Titian, Veronese, El Greco, Sir Joshua Reynolds, and Claude Lorrain, as well works by noted Spanish and Dutch artists. Medieval and early modern artists (13th-18th centuries) include Rembrandt van Rijn, Peter Paul Rubens, Jacob van Ruisdael, Massimo Stanzione, Bernardo Strozzi, Peter Wtewael, Joos van Cleve, Lorenzo di Credi, Jacob van Es, Niccolo da Foligno, Willem de Pannemaker, and Giovanni di Niccolo Mansueti; with media covering paintings, sculpture, alter pieces, and tapestries. In addition, the museum is noted for the strength of its nineteenth-century European collection, which includes works by Camille Pissarro, Pierre Auguste Renoir, Claude Monet, and Edgar Degas' famed sculpture, Little Dancer, Fourteen Years Old. UNL Office of Graduate Studies, departmental graduate programs, and the Medieval and Renaissance Studies Program all offer various types of funding that can support a semester of research or research trips for graduate students. We also have a listing of external funding sources for graduate research. Eder Jaramillo, PhD student in the Department of English, examines a book of hours at the Newberry Library during a workshop. 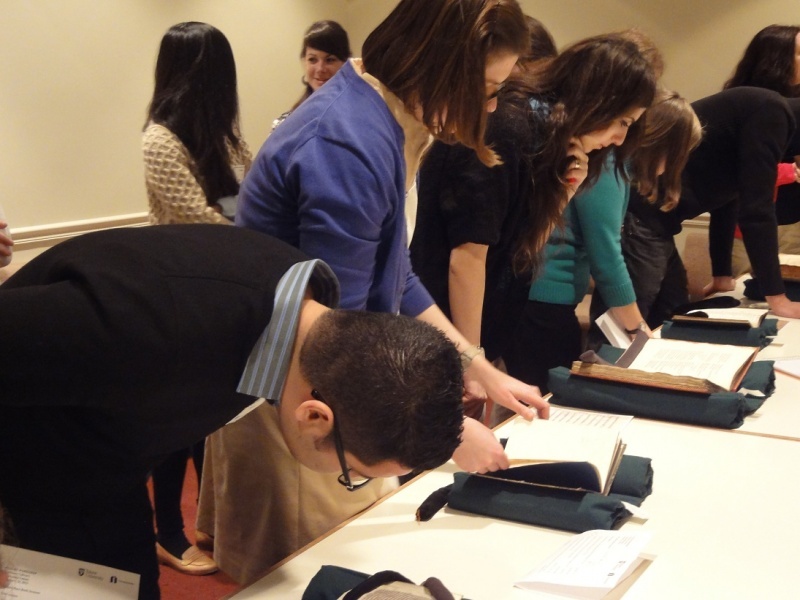 Student visit UNL Love Library Special Collections to see medieval and early modern books. Students visiting UNL Special Collections with Dr. Carole Levin examine a document with Queen Elizabeth I's seal. The Medieval and Renaissance Studies Program was proud to donate a reproduction of the Trevelyon Miscellany to UNL Special Collections. Learn more about Miscellany. Current (and some newly-admitted!) 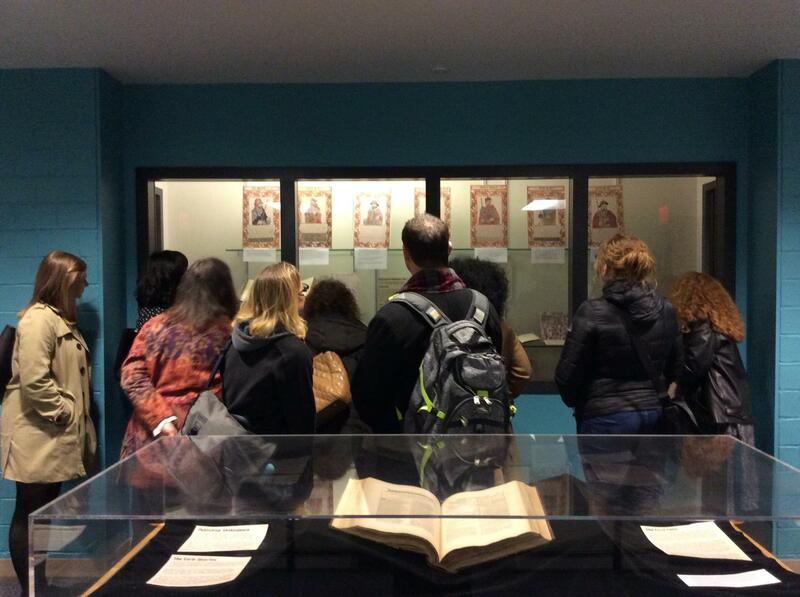 undergraduate and graduate students view the April-May 2016 Love Library exhibit on Shakespeare's World. Learn more in the Daily Nebraskan and UNL Today.